This vivid print celebrates the person who inspires you to be your boldest. We've all got someone who makes us feel a little bit braver. Celebrate their special magic with this vivid print. 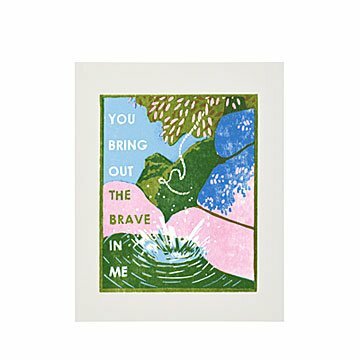 Based on a hand-carved woodcut made by artist Rachel Kroh, it's printed using a digital process that stays remarkably true to the original image. The result? A detailed, colorful tribute to the person who inspires you to be your boldest. Made in Indiana. Rachel Kroh studied printmaking at the School of the Art Institute of Chicago and, after seven years living and working in Brooklyn, NY, recently moved back to the Midwest and now makes her woodblock prints in Fort Wayne, Indiana. Her work is inspired by time spent outdoors. One of her favorite ways to create imagery for new prints is drawing from observation in parks and gardens. Now that she’s left big city life behind, Rachel enjoys drawing trees and wildflowers in the fields and prairies of her new home state. We chatted with Rachel about where art meets religion, how painting in the French countryside changed her life, and more in an interview on the blog.